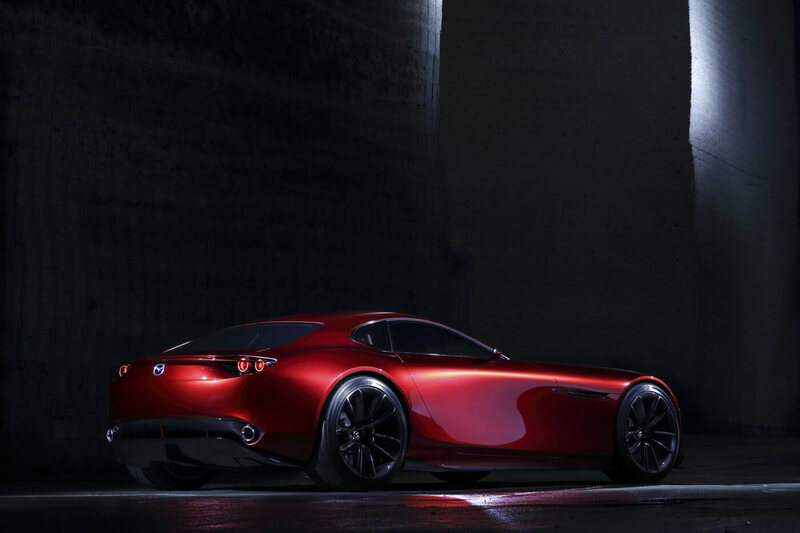 Mazda’s vision is to deliver true driving pleasure that will earn its cars a position as the customer’s partner, and will enrich their motoring lives. That motivates Mazda to continually defy convention and push the boundaries, building cars that match its unique vision. Mazda is the only carmaker in the world to successfully bring to market and mass-produce the rotary engine. It is a symbol of the company’s tirelessly challenging spirit and, as the soul of the Mazda brand, it represents the unique and innovative technology that helped establish the brand and create a solid bond between Mazda and its customers. That is why rotary engine research and development continues today, even though there are no rotary-powered cars in the current product lineup. 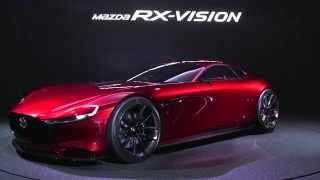 The Mazda RX-VISION rotary sports car concept introduces the next-generation SKYACTIV-R rotary engine and Mazda’s vision of the ultimate in front-engine, rear-wheel-drive sports car styling. Making its world premiere in Tokyo, the RX-VISION represents a vision of the future that harbors the soul of the Mazda brand. 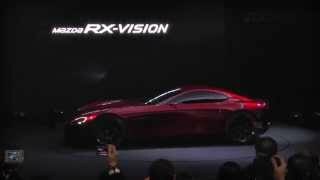 RX-VISION adopts the beautiful proportions of an FR sports car as could only be envisioned by Mazda. The styling is modern but maintains a sense of lineage and authenticity, encapsulating Mazda’s entire history of sports car design. A low and wide body, short overhangs and taut cabin make the model immediately recognizable as a sports car. These elements combine with the low overall height and incredibly low hood made possible by the compact and lightweight next-generation SKYACTIV-R rotary engine to create truly one-of-a-kind proportions. The design aim was to shave away all but the essentials and give birth to the dynamic tension and ambience of a machine that is all business. The fine craftsmanship of Mazda’s renowned clay modelers creates reflections that convey motion and thereby capture the spirit of the KODO design language without relying on character lines or other such elements. It is an elegant and highly vital form that changes expression with the slightest change of viewing angle. A special red chosen for the body color features both energetic brightness and depth. It helps bring out the luster and contrast between light and shadow that are present on the RX-VISION. 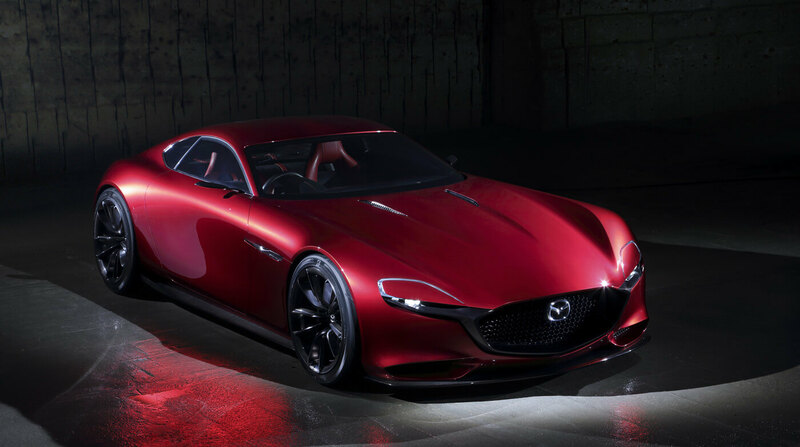 Weaving some design motifs that reflect the history of Mazda sports cars into the design of the RX-VISION expresses Mazda’s unchanging passion for the sports car. For the interior, the design team pursued an ultimately simple yet powerful image, while fusing it with the tactile feel of handcrafted work and a sophisticated mechanical expression. Intricate instruments give the cockpit a true machine appeal, which in combination with the simple instrument panel and genuine leather trim with a saddle motif for the center tunnel create an interior atmosphere that speaks of handcrafted warmth and quality yet maintains a sense of tension. Working to realize the ideal internal combustion engine, Mazda returned to the drawing board and built the SKYACTIV-G gasoline engine and SKYACTIV-D diesel engine from scratch. Even after discontinuing production of the RX-8 in 2012, Mazda continued research and development to further evolve the rotary engine. This next-generation rotary engine has been christened SKYACTIV-R, a name intended to represent the company’s firm resolve in applying the most advanced technologies and the same high aspirations that yielded SKYACTIV TECHNOLOGY towards achieving a breakthrough in addressing the three key issues with rotary engines — fuel economy, emissions performance and reliability.